Virtual Bookkeeping Services and Virtual Accounting Services has become a standard business practice that enables small business, start-ups etc. Virtual Bookkeeping service providers used to have required skills that are helpful for growing business. As your business grows to the point where we need to a bookkeeper than you need a bookkeeper to manage the different task of business. But you do not have resources to hire an additional full-time employee and extra equipment and space in the office. Than outsourcing will be the right choice for you. 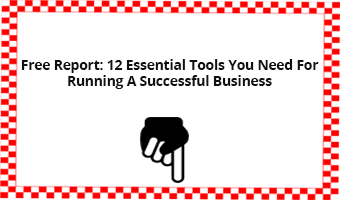 • If your business is small, you don’t require full-time bookkeeper. Only you required the person with more skills than the office manager and receptionist. • If your business is big, you require full-time bookkeeper. But you do not hire them at the affordable cost or low cost. 1. Cost Effective:- Virtual Bookkeeping Services and Virtual Accounting Services are beneficial in the term of cost. You can hire professionals, according to your requirement and budget. You save money on paying the salaries and benefits for the full-time or part-time employee, as you can pay for what you need. So there is no loss in productivity costs that come along with hiring the full-time employee. 2. Expert Services:- Bookkeeping and accounting service providers continuously have to improve their skills and qualifications to stay competitive in the market, so you can be sure that you are handing over your accounting to a reliable and knowledgeable person. It means outsourcing may offer you the possibility to hire a professional with a higher level of expertise at the affordable price. 3. Time Management:- Whenever your business grows, you need to spend more time to manage your money as well as expanding the business. Therefore, the Virtual Bookkeeping and Accounting service provider helps you to focus your time, energy and resources on creating the business strategies without any time limit as per your time. So you can utilize your precious time by expanding your business and other essential works. 4. Flexible benefits of employee:- When you outsource – Virtual Bookkeeping Services and Virtual Accounting Services, you have the advantage to using his/her services only when you need them. This flexibility factor is useful for small business, start-ups as they not have enough bookkeeping work on a daily basis. Another thing is if the person/employee does not perform to your expectations and requirements, you can easily terminate the contract. 5. Consulting:- If you are looking to expand your business, it is useful to have a reliable and experienced expert alongside, who can provide you with various financial plans and options to reach your goals. The outsourcing provides you a good way to have full-time professional aside your team. Once you made a decision to outsource- Virtual Bookkeeping Services and Virtual Accounting Services, the next step is to choose an outsourcing company that will be fit to your goals and objectives. Using Virtual Accountancy and Bookkeeping, the quality of performance and efficiency must be the top priority. 1. What Service you are in need:- To hire a Virtual Bookkeeping & Account Services first you have to decide what services you actually required from the employee. Suppose if you required preparation of reports, balance sheets, payroll services etc at the end of the month that no need to hire a bookkeeper for full time. It would be, you need to be clear on what you do personally, what you’re in-house staff is responsible for and what you want someone else to do. 2. Competitive Cost Range:- Every accounting and bookkeeping company have their payment schemes – some of them charge by the hour, others on a monthly basis. 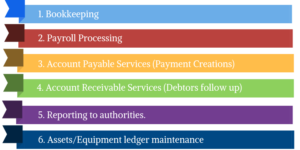 Therefore, you can choose the payment term that suits your needs and budget the most, but do not make your decision only based on the cost-effectiveness. 3. Data Security:- Data security plays an important part when outsourcing accounting services online. The highly respectable firm handles their clients’ data with most required privacy and ensures that each transaction is secure. It is important because you will be not only communicating cash flow information to them but also confidential data. 4. Expertise:- Make sure, that the company you want to hire is experienced, professional and has the right qualifications. Remember you can always ask for some recommendations from their previous or existing clients look at their reputation in the market, financial stability, but most importantly, their ability to deliver high quality and consistent results. 5. Flexible Service Level Agreement:- The company you want to work with must be flexible enough to use the latest accounting software, such as the advanced spreadsheets, economic, Dinero, Billy’s Billing, SAP, Navision, QuickBooks, and Xero, that will be compatible with your type of work. Also, it must show their flexibility and desire to match your future needs and requirements. Besides, we suggest to check the term and conditions before you sign the contract, so you will be aware of how to terminate the agreement if you are not satisfied with their work. There was a time when only large corporations could get benefits from outsourcing their back-office operations. But nowadays small companies are also hiring Virtual Accountant to make it flexible. It is more important now that you have an outsourcing strategy aligned with your firm-wide business strategy. As your business expands, the scope of your financial operations is likely to increase, as well. 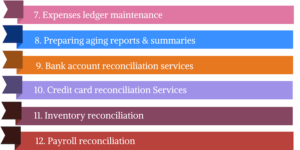 So you may require additional bookkeeping assistance to help you in business. 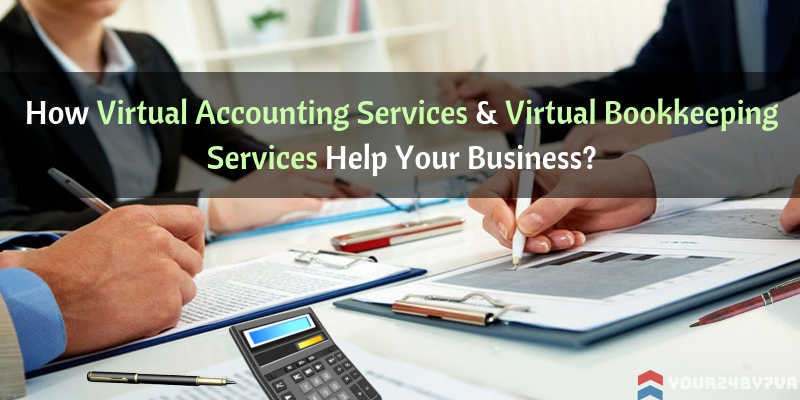 A Virtual Accounting Service Provider to handle your accounting and bookkeeping is quite beneficial for small and for small and medium-sized businesses both. Aspects like financial budgeting, estimations, cost-benefit analysis staff overhead costs, and tax obligations need to be precisely calculated and made available. It’s time to focus on your business growth rather than struggling to understand the reason why your books don’t balance. Well, now you can manage everything with the help of our professional Virtual Accountants and Bookkeepers. Contact us for a Free Consultation @ +1-646-844–2755 to avail quality Virtual Bookkeeping & Accounting Services at the reliable price today!